These sculpture are modeled after a 1559 marble original by Germain Pilon (1535-1590). 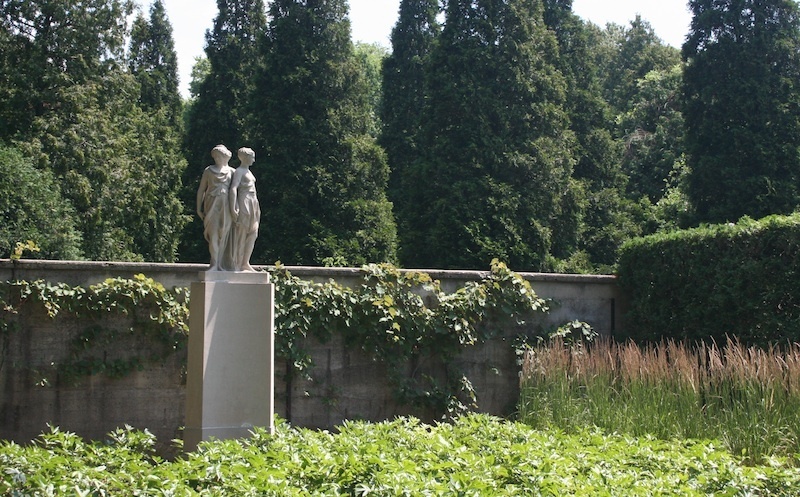 The limestone group figures approximately 6' high along the east wall of Peony Garden in Allerton Park. Robert Allerton gifted these artworks to the University in 1946. 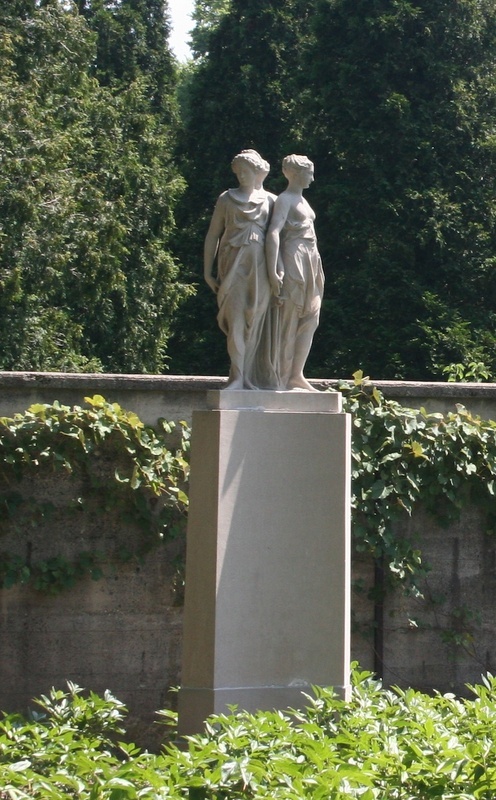 Allerton had two limestone copies of Pilon's Three Graces made. One adorns the east wall of the Peony Garden, on the path west of the Visitors' Center; the other is at the Lake Geneva, lllinois, grave of his aunt, Mrs. Lester McCrae. 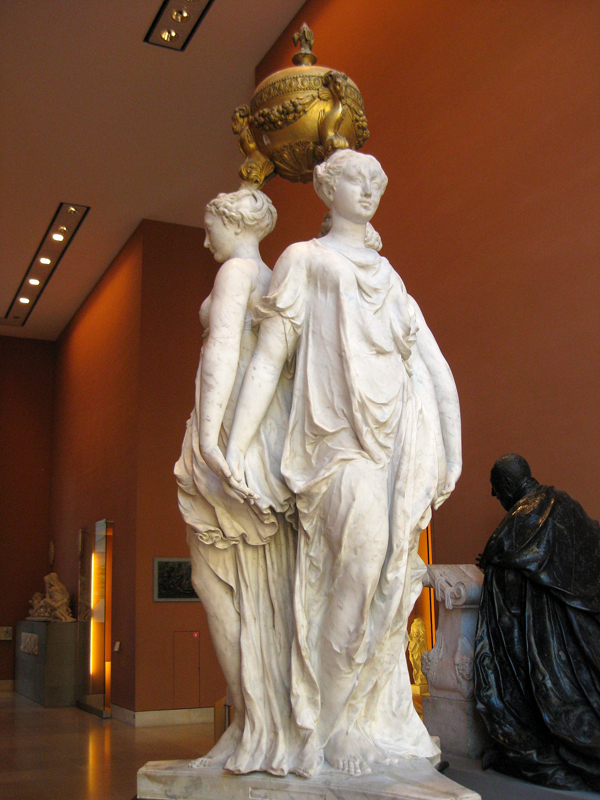 In Greek mythology the Graces - Aglaia, Thalia, and Euphrosyne - personified beauty, charm, and grace. Assoctated with the arts, they were known as smiling goddesses whose presence brought joy to the world. Pilon created the figures as elegant marble caryatids, for they supported a large gilt bronze funerary urn (by Domenico Fiorentino) that held Henry II's heart. With an inscription stating that the Graces "are holding up a heart that was once its own," they comprised a tomb commissioned by Henry's grieving widow, Catherine de Medicis, who gave it to the monastic church of the Celestines in Paris. During the French Revolution the heart disappeared. The statue and now empty urn are displayed in the Louvre. Partially draped in heavy, deeply cut cloth, the long-limbed figures stand motionless back to back in a circle, holding hands, poised as if ready to begin light dance movements. An engraved incense burner by Raphael and Raimondo served as Pilon's artistic source. Pilon was court sculptor to the later Valois sovereigns, excelling at portraiture. His busts of Henry II and Francis II are in the Louvre, as is the work considered his masterpiece, the kneeling bronze of Chancellor Rene de Birague. He did more than create sculpture: as Master of the Mint under Charles IX he produced fine medals, medallions, and coins. 515 Old Timber Rd, Monticello, IL 61856 ~ The figures can be found along the east wall of Peony Garden in Allerton Park. Muriel Scheinman, “The Three Graces, before 1916,” ExploreCU, accessed April 19, 2019, https://explorecu.org/items/show/48.